The Hilton San Francisco Union Square is required to separate organic waste per city regulation. Under the leadership of the hotel’s Community Projects Manager, the property has gone above and beyond to build a food waste prevention culture among its staff. The following highlights the Hilton San Francisco’s successes preventing, donating, and diverting food waste. As the largest hotel on the West Coast, the Hilton San Francisco prepares well over one million meals for guests and conference attendees every year. Recognizing that food insecurity and food waste are two of the biggest challenges facing local communities, the hotel’s staff pride themselves on working diligently to prevent and reduce food waste through smart purchasing, mindful preparation, food donation, and composting. Key to the hotel’s success are the efforts of Jo Licata – who has been Community Projects Manager for 22 years – the engineering team, the food and beverage team, and approximately 1,100 employees. The Hilton San Francisco has successfully reduced its produced food waste through mindful purchasing of locally-sourced and in-season products, working with “imperfect produce” sources, using the whole product wherever possible, and implementing portion control serving utensils in the employee dining halls. Great care is taken to ensure that any viable food is appropriately donated to local shelters and agencies. The hotel has been working with Food Runners of San Francisco for over fifteen years. 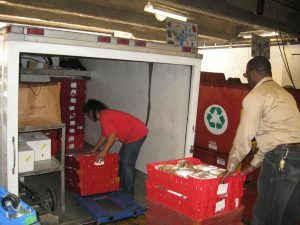 Food Runners volunteers make regular pickups at the Hilton loading docks, taking leftover meals from the hotel to various shelters and programs around the neighborhood. In October 2016, over 2,000 box lunches were donated during the hotel’s busiest conference. 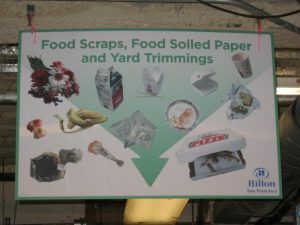 For any food that cannot be rescued and donated, the Hilton has composted its organics since 2002. The composting program saves the hotel approximately $7,000 per month in waste hauling fees. The Hilton San Francisco has found that an effective food waste program requires consistent commitment from the staff and regular training and awareness building. The program also requires significant coordination of efforts across the Banquet Operations, Kitchens, Engineering, Stewarding, and other key members of hotel operations. Timing for food donation pickups must be coordinated with partner organizations, and advance notice is required from both the donor and the recipient organization. However, careful coordination and commitment has enabled the Hilton San Francisco to contribute to the fight against food insecurity in the local community, while simultaneously reducing operating costs. The hotel will continue to drive forward its food waste and recovery programs, including collaborating with WWF to track, monitor and further reduce food waste.